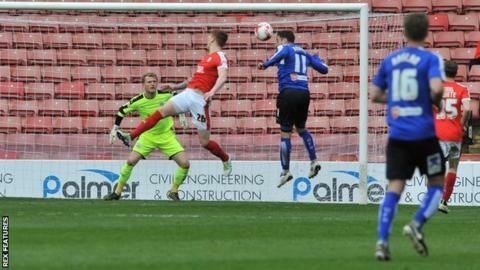 Ten-man Chesterfield edged out Barnsley to boost their own survival chances and dent their hosts' play-off ambitions. Lee Novak put the Spireites ahead, nodding in Gboly Ariyibi's cross, for his 14th goal of the season before Adam Hammill's deflected equaliser. Jamal Campbell-Ryce was dismissed for two yellow cards, one for kicking the ball away, but Ollie Banks side-footed home to restore Chesterfield's lead. Hamill then hit the post as Barnsley could not find a late leveller. Defeat in their first league game since winning the Johnstone's Paint Trophy means Barnsley are now six points off the League One play-off positions. Chesterfield, meanwhile, have now opened up a four-point gap between themselves and the relegation places. Match ends, Barnsley 1, Chesterfield 2. Second Half ends, Barnsley 1, Chesterfield 2. Substitution, Chesterfield. Jordan Slew replaces Lee Novak. Attempt missed. Josh Brownhill (Barnsley) right footed shot from outside the box is too high. Corner, Barnsley. Conceded by Charlie Raglan. Substitution, Barnsley. Harry Chapman replaces Aidan White. Marc Roberts (Barnsley) hits the left post with a header from the centre of the box. Attempt missed. Conor Hourihane (Barnsley) left footed shot from the centre of the box is close, but misses to the left. Adam Hammill (Barnsley) is shown the yellow card. Goal! Barnsley 1, Chesterfield 2. Oliver Banks (Chesterfield) right footed shot from the centre of the box to the bottom left corner. Assisted by Gboly Ariyibi. Attempt missed. Marley Watkins (Barnsley) right footed shot from the centre of the box is too high. Second yellow card to Jamal Campbell-Ryce (Chesterfield) for a bad foul. Aidan White (Barnsley) wins a free kick in the attacking half. Attempt missed. Conor Hourihane (Barnsley) left footed shot from outside the box misses to the left. Jamal Campbell-Ryce (Chesterfield) is shown the yellow card for a bad foul. Goal! Barnsley 1, Chesterfield 1. Adam Hammill (Barnsley) right footed shot from outside the box to the top right corner. Attempt missed. Alfie Mawson (Barnsley) header from the centre of the box is too high. Attempt saved. Ivan Toney (Barnsley) right footed shot from outside the box is saved in the top left corner. Attempt saved. Sam Winnall (Barnsley) right footed shot from outside the box is saved in the bottom right corner. Attempt missed. Alfie Mawson (Barnsley) header from the centre of the box misses to the left. Substitution, Barnsley. Ivan Toney replaces Ashley Fletcher. Substitution, Barnsley. Marley Watkins replaces Lloyd Isgrove. Corner, Barnsley. Conceded by Thomas Lee. Attempt saved. Sam Winnall (Barnsley) header from very close range is saved in the top right corner. Attempt missed. Jamal Campbell-Ryce (Chesterfield) header from a difficult angle on the right is too high.